Our four station Oxygen Bar delivers a higher concentration of purified oxygen for a relaxing, rejuvenating and therapeutic effect. The addition of aromas to the Oxygen Bar completes the sensory experience, delivering a clearer mind, heightened awareness and a feeling of balance. 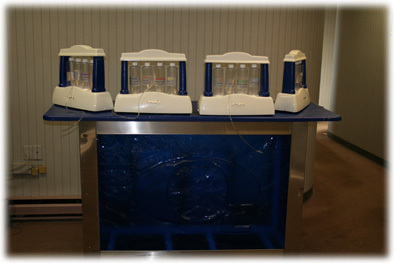 The Oxygen Bar makes a great focal point for our ultimate relaxation package or on it’s own as a unique event. Take a deep breath. Go ahead. Inhale. It’s oxygen. All over the world, people are discovering the joys of oxygen bars. They’re popping up everywhere, from health clubs to nightclubs. Now, we bring it to you. Our four-station oxygen bar delivers a higher concentration of purified oxygen for a relaxing, rejuvenating and therapeutic effect. The addition of our aromas completes the sensory experience delivering a clearer mind, heightened awareness, and a feeling of balance. It’s a great focal point for our ultimate Relaxation Package, or it can stand alone as its own unique program. Your guests will be talking about it long after the party is over. For more information on any of these great events, please contact the agent that referred you to this site.